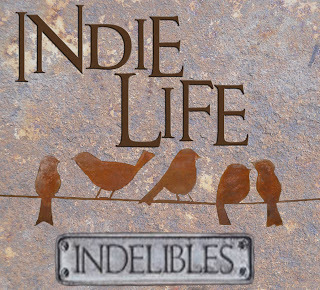 Welcome to my Indie Life post for June. This is a monthly feature posted on the second Wednesday of the month and hosted by the Indelibles. The aim is to promote, encourage, and support indie authors. Being an Indie is hard. There are so many things we need to do in order to stay on top of it all. Not only are we writers, but we're bloggers, networkers, marketers, editors, proof readers, designers, tax agents, and the list goes on, and on. Today I want to talk about knowing when to ask for help, and to take a step back. As much as we want to, we can't do everything. We need to learn to ask for help once in a while, and we need to learn to step away from something if it's not working. A week or so ago I made a decision. I'd just come out of the launch of my novella, Sacrifice, and I was feeling completely exhausted. After some thinking, I realised it was because I had got to the point where I wasn't in love with my characters anymore. I've put so much time and effort into The Tate Chronicles, I was burnt out. I knew if I tried to keep going with the draft of Fight For Me, I'd get nowhere. Not because I hate my characters now, because I don't, I just don't love them like I used to. It's like spending all your time with one person, it can sometimes get old. I needed a break! So, I put Grace, Josh and Seth aside, and I decided to concentrate on another story I wrote a year or so ago. It's in the process of getting a complete re-write, and I'm loving doing it. It feels fresh, and new, and exciting. All those things that were missing with Fight For Me. I'll come back to Grace, Josh and Seth when the time is right, and everything will fall into place with their story. I just need some time away from them. Now is where I get to the part about taking a step back. I'm a designer, and I love designing my covers, but for this book I knew I wasn't going to be able to pull it off. It's a fantasy set in a completely imaginary world. Where am I going to find a stock image for what's inside my head? I stumbled across a freelance illustrator on twitter, so I thought I'd make an enquiry. We've been sending emails back and forth for a week or so, and I'm starting to get really excited because everything is coming together. I took a step back and let someone else handle something I knew I couldn't, and I'm so much happier for it. It's ok to ask for help. Whether it be with your cover, your editing, or just asking someone who has done it before what their experience was. We're not all good at everything. It's better to do one thing really well, than ten things poorly. Make sure you check out Lawrence Mann and his awesome art. I'm so glad I found him, and I can't wait to see my final cover art. Awesome post. We can do most things, but not always everything and your investment will be well worth it :). His work looks fantastic too!